The coin was struck between 2nd and 1st century BC. It is a representive type, called Inoteşti - Răcoasa. 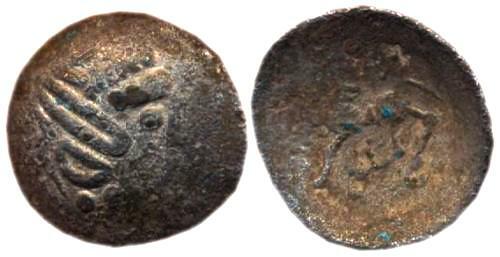 Coins of this type were found especially in the south of Moldavia. Although only lacunarly matching the Macedonian original, still, the Dacian simplification shows a special creativity and a certain conception of the abstract spectacular in its nature. Macedonian coins have been used on large scale in Illyria, Dacia, Thrace, as well as inside Asia Minor, being imitated not only by the Dacians, other peoples using the pattern as well. Romanian historian Nicolae Iorga (History of Romanians, Ancestors before the Romans), wrote about the Dacian imitations of the Macedonian tetradrachmae: "...clumsy local technicians were giving scorched coins on which barely one can tell the countenance of Zeus and the horse...".